Corboy & Demetrio Law Clerks Mary Daly and Gino Jacobazzi participated in the National Criminal Trial Advocacy Competition in San Francisco in October, placing third, overall, out of 20 teams. Mary and Gino are members of the Criminal Law Mock Trial Team at Loyola University Chicago School of Law where they are both students. 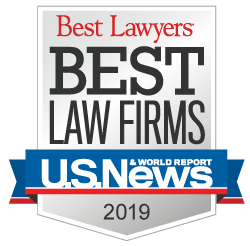 They’re in very good hands because the team is coached by Corboy & Demetrio Attorney Andrew P. Stevens, who has served as coach for the last three years. Andrew was named Mock Trial Coach of the Year for 2018 by Loyola, and he served and placed nationally on mock trial teams when he was a student at Loyola. 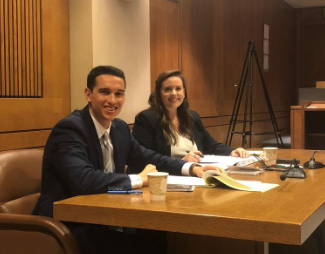 At the recent National Criminal Trial Advocacy Competition, Mary and Gino’s team put on a total of 4 trials over four days. Their team knocked the 2017 defending champions, Southwestern Law School, out of the competition in its Friday night round and advanced to the Quarter-Finals from there. Mary and Gino’s team competed in back-to-back trials for both the Quarter-Finals and Semi-Finals on Oct. 13th where their team finished third. The team argued the case of a babysitter charged with the murder of a 17-month-old baby whose death showed signs of shaken baby syndrome. The case involved the alleged false confession of the defendant and a lot of medical expert testimony.